The United States of America, also referred to in short form as the United States, the USA, the U.S., and colloquially as America, is a country in North America that extends from the Atlantic Ocean to the Pacific Ocean, and shares land borders with ► Canada (including ► Quebec) and ► Mexico. To the west of Alaska lies ► Russia, to the south and east of Florida ► Cuba, the ► Bahamas and ► Bermuda are located. The United States is a federal constitutional republic, with its capital in Washington, D.C. It consists of fifty individual states and a number of territories and other federally administered areas. At over 3.7 million square miles (over 9.6 million km²), the United States is the third largest country by total area. It is the world's third most populous nation, with over 300 million people. Asssociated commonwealths are the ► Northern Mariana Islands and ► Puerto Rico, other organized unincorporated territories are ► Guam and the ► United States Virgin Islands. The unorganized unincorpated territory with self-government is ► American Samoa. The unincorporated unorganized territories are ► Baker Island, ► Howland Island, ► Jarvis Island, ► Johnston Atoll, ► Kingman Reef, ► Midway Atoll, ► Navassa Island, ► Wake Island and the incorporated unorganized territory is ► Palmyra Atoll. The United States have the ► Guantanamo Bay Naval base on ► Cuba. ► Palau, the ► Marshall Islands, and ► Micronesia are freely associated with the United States. Maritime borders are shared with ► Japan and the ► Philippines. 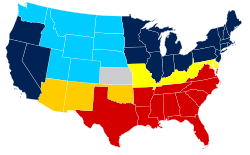 Main minority languages Español: Estados Unidos de América Los Estados Unidos de América es un país de América del Norte conformado por una federación de 50 estados y un distrito federal. También tiene varios territorios dependientes ubicados en Antillas y Oceanía. Su forma de gobierno es la de una república presidencialista y federal. Cuarenta y ocho de los estados están en la región entre Canadá y México. A estos estados se les llama, más o menos formalmente, los Estados Unidos continentales o contiguos y en ocasiones los 48 de abajo. Alaska está en la zona noroeste de América del Norte, separada de los otros estados por el territorio canadiense de Columbia Británica. El archipiélago de Hawaii, el estado número 50, se ubica en el Océano Pacífico. La capital federal, Washington, se sitúa en el Distrito de Columbia, entre los estados de Maryland al norte y Virginia al sur. Tagalog: Estados Unidos ng Amerika - Ang Mga Nagkakaisang Estado ng Amerika na mas kilala sa pangalang Estados Unidos ng Amerika ay isang republikang pederal na mayroong limampung estado. Karaniwang tinatawag na “Amerikano” ang mga mamamayan nito. French: États-Unis d'Amérique - Les États-Unis d'Amérique sont une fédération constituée de cinquante États (représentés par les cinquante étoiles du drapeau) situés en Amérique du Nord et dans l'océan Pacifique. Quarante-huit de ces cinquante États sont situés au sud du Canada et au nord du Mexique. L'Alaska est située à l'ouest du Canada. Hawaii est dans l'océan Pacifique, à 3 900 km au sud-ouest de la Californie. Washington, D.C., est la capitale fédérale du pays, avec un statut spécial (ce n'est pas un État et le district n'est pas non plus membre d'un État fédéré). D'autres territoires ont des statuts spécifiques, notamment des États (anciennes colonies) qui ne sont pas membres de droit de la fédération, mais qui sont en pratique intégrés : les Samoa américaines, Guam, les îles Mariannes du Nord, Porto Rico et les îles Vierges américaines. German: Verenigte Staaten von Amerika - Die Vereinigten Staaten von Amerika sind eine Bundesrepublik in Nordamerika. Das Land nimmt rund die Hälfte der Landmasse des Kontinents ein und ist der flächenmäßig drittgrößte Staat der Erde. Italian: Stati Uniti d'America - Gli Stati Uniti d'America sono una repubblica federale con sistema rappresentativo dell'America settentrionale composta da 50 stati e un distretto federale (Washington, D.C.). Gli Stati Uniti confinano a nord con il Canada e a sud con il Messico, mentre ad est e ad ovest sono bagnati rispettivamente dall'oceano Atlantico e dall'oceano Pacifico. Le acque territoriali dell'Alaska - lo stato più vasto - confinano con la Russia (Stretto di Bering). Lo stato delle Hawaii è formato da un arcipelago localizzato nel centro dell'oceano Pacifico. Il paese possiede anche alcuni territori e zone insulari, sparsi tra il mar dei Caraibi e il Pacifico. Status Independent country since 1776 (recognized 1783). Permanent Member of the UN Security Council. More images United States - United States (Category). This section holds a short summary of the history of the area of present-day the United States, illustrated with maps, including historical maps of former countries and empires that included present-day the United States. The 1606 grants by James I to the London and Plymouth companies. 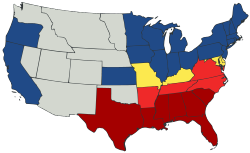 Map of the United States in 1864, showing the division during the Civil War. Several different air masses affect the United States. A map of the average annual high temperatures in the United States. Record one day precipitation by county between 1979 and 2011. Average annual tornado reports in the United States. The U.S. power transmission grid consists of about 300,000 km (190,000 mi) of lines operated by approximately 500 companies. The North American Electric Reliability Corporation (NERC) oversees all of them. US nuclear power plants, highlighting recently and soon-to-be retired plants, as of 2018 (US EIA). Map illustrating installed wind generating capacity for U.S. states at end of 2015. Map of large US wind farms, with size illustrated. Fixed-tilt utility-scale solar energy generation capacity, representing 40% of US solar energy output. Map does not include tracking systems. 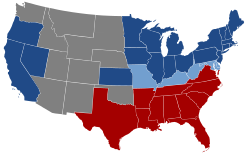 Map showing current rail speeds in the United States. Density of cattle and calves by county in 2007. A physiographical map of the contiguous 48 states of the U.S. The map indicates the age of the exposed surface as well as the type of terrain. This page was last edited on 28 March 2019, at 17:13.